Let’s start with the H’s and W’s. Can you tell me who you are, what and where you farm, how long you’ve been farming, and lastly, why you’ve chosen to be a farmer? My name is Dana Gentile and I am a meat goat farmer. 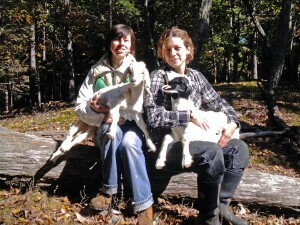 My partner Abbi and I started our farm, Darlin’ Doe Farm, in October 2009. 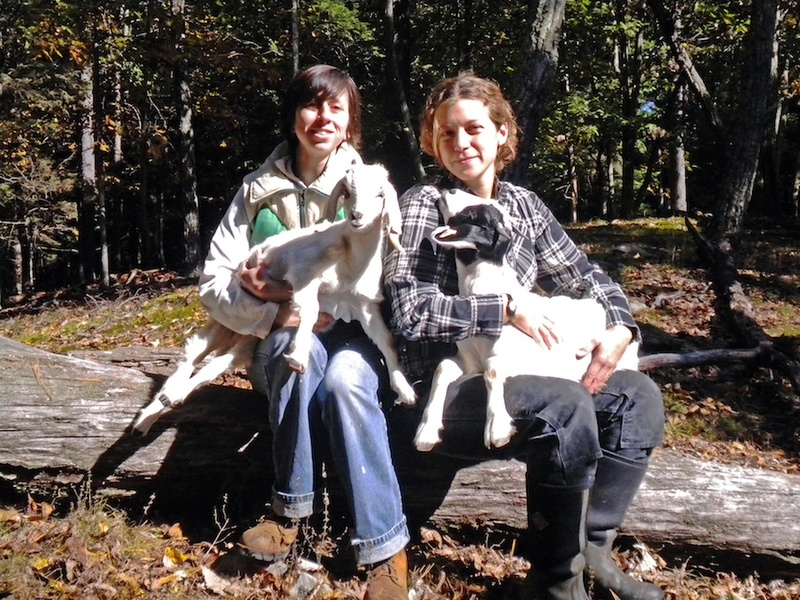 We are currently renting land in Saugerties, NY for our small herd of meat goats. We believe in a natural and holistic approach to raising healthy livestock. I enjoy working with animals on a daily basis. I like growing my own meat and becoming a local source for naturally raised goat meat. Being able to provide my family, friends and customers with healthy, high quality meat is why I became a farmer. What did you do before you started Darlin Doe? Have you found it to be an easy transition from your previous job? though. I worked with Awesome Farm raising sheep, meat chickens and laying chickens, and got hooked on livestock farming. The transition was not difficult since I had built a small community of farming friends before jumping into it. Do you have any history of farming in your family, or any experiences on farms that were influential in your choice to farm? Not really. I grew up in suburban Long Island and only dreamed of farm living. My dad always had a big vegetable garden in our backyard and in the summer months we would have fresh tomato salads and zucchini all the time. My father was born in Italy and had relatives who farmed, but I have only been there a few times. I had limited contact with my Italian relatives and only now am trying to reconnect my family roots to my present farming practices. What do you think are the challenges of starting a farm in today’s economic landscape? In general people are buying less “stuff” in the current economy, but people will always have to buy food to survive. We just need to make sure that we educate our customers on buying the healthier, local, small family farm food that will boost our economy. As a producer it is hard to adjust prices at this time, but we can figure out more ways to help our neighbors with donations of food to soup kitchens. Ha! You are a riot, this is a custom made camouflage Sony walkman that I’m recording our interview on, great observation. But let’s get back to answering My questions, yes? What are your relationships like with the older farmers in your field of work? For the most part, I find that older farmers are interested in sharing their knowledge. We may not have the same farming practices, but they are experienced and love to share what they know. I apprenticed with an older goat farmer and after my summer working with him, he suggested that I buy a herd of my own and work with them on his land. If I did not have this opportunity I could not have started farming when I did. I have faced challenges with this situation since I would like to work on improving the land and he is interested in keeping everything the same. Farming is not necessarily being passed down only among family members any more, so older farmers are looking for new young farmers to take over what they have spent all their time perfecting. As young farmers we have new ideas and practices to add and it takes a little convincing on our part, but it is worth the effort in the long run to be able to provide an even better product to the public. What forms of marketing do you employ, and which have you found to be the most successful? Well, I am just starting to market my meat. I am working on getting a website up, and Facebook is another great way to market a small business online. I also started to donate product to small local auctions to get new customers and to have more people see my products, and small farmers market are also a great place to get started. The possibilities are seemingly endless so we’re still figuring out what strategies work best for us. Word of mouth is of course a good old standby so we talk about our product everywhere go, to anyone who will listen! Dana, lets talk start up funding. Of the alternative options that exist to using our savings, or the use of bank loans to start an agricultural endeavor, have you found grants, sponsorships or other financial assistance programs to be accessible during these initial years? I do not know very much about this. I have only used my savings as investment into my business. It’s frustrating because a lot of agricultural grants are generally for landowners. Owning land to farm on is a big startup expense that many young farmers can’t afford. Renting works, but as I mentioned, can present its own problems if the new farmers practices clash with who they’re renting from. I do know that a lot of opportunities exist, but finding the time to research them all, write out the proposals, etc. is a challenge, given how many hours of the day I need to spend working on the farm, making and marketing the product. Has marketing Goat meat presented you with any challenges? If so, how are you attempting to overcome them? The challenges have come mainly because most people have never eaten goat meat before. Goat is hard to compare to other meats. Contrary to popular perceptions, it is not gamey. When prepared correctly it is quite succulent and flavorful. As for texture, that depends on how it is prepared. Roasting yields results similar to lamb, but preparing goat meat for a stew will give you meat that’s more like pulled pork—juicy goodness easily coming off the bone. Or thin strips of goat meat can be baked or quickly sautéed to put in a goat taco, in which case the texture is more like a thin strip of beef. Goat is very versatile! We are interested in explaining to our customers but it would be wonderful to also have our goat at more events where many potential customers can have a taste of the meat as an introduction. What advice would you give to anyone who is in the first year or preliminary stages of starting a meat production farm? Talk to as many meat producers as possible. Farm visits are important. Hear all the pros and cons about your future product. Get connected to other farmers. Having the support of other farmers has been key to getting through the first year. Thank you so much for your time and interest in the local food economy, best of luck to you in your present and future endeavors.